Use this free plug-in for Outlook Express and Windows Mail to resend e-mail messages with a mouse click. Once you install the plug-in, a new item, "Resend message...", is added under the Message menu. You highlight the sent message in the Sent Items folder and click the Resend Message button. The e-mail is opened for editing. You can resent it as is, or make the desired changes, then click Send and the message goes. 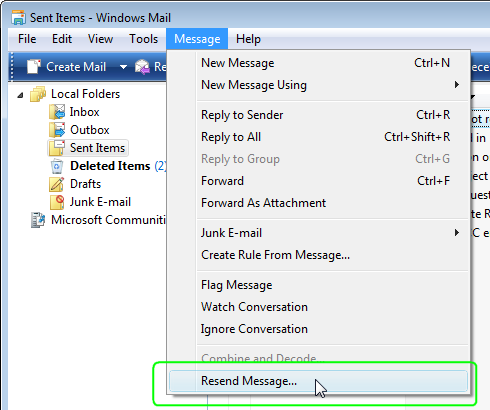 With the Resend Message plug-in you can resend messages not only from the Send Items folder. You can easily do it from any Outlook Express or Windows Mail folder, except for Drafts. This site does not contain serial number, crack, keygen Resend Message for Outlook Express serial number : serial number is the simplest type of crack. A serial number(cdkey,product key,etc) is register the program as you may already know. a crack or keygen may contain harmful software. If you cannot find the exact version you want, just give it a try. for more information read .nfo/.txt/.diz file include in zipped file.